The construction industry is changing rapidly. With BIM (Building Information Modeling), there is potential to save up to 20% costs within projects. • Clean visual base to show a potential customer. • Internal product configuration that reduces the construction time. • External product configuration on your website, where the customer has access to configure his own product. • Integrated systems where data from multiple systems are aggregated to give a clearer picture of the project. • One model for architects, builders, clients, plumbing, electricity, etc. for more efficient work. • Access to all data on the part of the property you are interested in when managing or making major upgrades. Previously, the construction industry has lost a little in terms of digitization comparing to the mechanical industry. This is because mechanical industry has not been as much affected by global competition as the construction industry. The British government’s BIM initiative aimed at lowering the cost of state-funded construction projects with 15–20% which has forced the development. Today the construction industry is moving past the mechanical industry. In order to achieve its goal of reduced costs, initiators in England have modernized the BIM concept and divided it into levels. From 2016, as a construction company you must meet the ”BIM Level 2” (below) to be part of and work on a government-funded construction project in England. 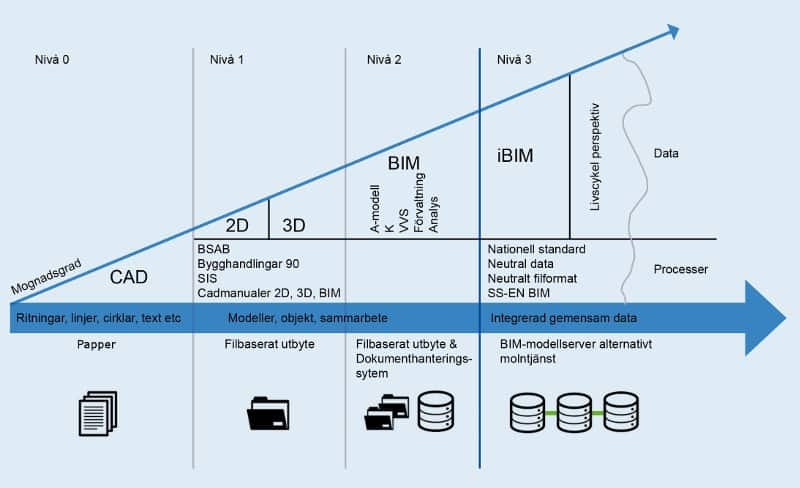 This has brought big changes in the Swedish construction industry, where several government customers now demand construction projects to be run with BIM. Larger Swedish construction companies have been working with BIM for a few years, which means that subcontractors also have started to use BIM. In Sweden, it is not clearly defined which level of BIM that is required. In larger projects it is usually about Level 2. However, we know that many still work in Level 1. Drawings and unstructured CAD information in 2D are placed in level 0. Printed documents constitute the basic information and are considered as original documents. In level 1, the work takes place in 2D or 3D with a certain amount of standard information. This also involves visual coordination in a common computer environment. Within the administration, drawings and documents are stored in file-based systems. The work in level 2 is model-oriented and properties are linked to the different objects. The layout of the building is presented in 3D. In level 3, a building is fully described in the models that are also used in the management and maintenance work. You can search for related information of buildings and management data for the property portfolio. Open standards are a requirement.